Edward William Godwin, was born in Bristol in 1833, and perhaps by a happy accident of fate, as it was there, in the hothouse environment of a rambling garden on the banks of the River Frome, a bustling urban architect's office, the columns of The Western Daily Press, and one of the busiest shipping hubs for the import of Oriental artefacts, that Godwin would cultivate his eclectic passions for journalism, costume design, theatrical production, architecture, interior design, and all things Japanese. Godwin was raised in an aspirational family of social climbers. His father was a thriving leather merchant, whose upward mobility resulted in a change of residence to the suburban Earl's Mead Estate. Their new home boasted the largest gardens in the neighbourhood, complete with it's own decaying church ruins, thereby creating the perfect symbiosis of form, space and bygone mystique. Confronted with such evocative subject matter and armed with a sketchbook, the young Godwin felt compelled to translate these mesmerising medieval forms onto paper. And so the seed of inspiration was planted, and Godwin set his sights on a career as a professional architect. Godwin had already cut his teeth as a self taught draughtsman by copying illustrations from J.R.Planche's A Cyclopaedia of Costume or Dictionary of Dress, and sketching the views in his garden, a skill that would prove invaluable as he received little hands-on training under the tutelage of the Bristol Architect William Armstrong. Notwithstanding, he served his apprenticeship and by the 1850's had earned his wings with a commission of a school in Easton. This was followed by a sojourn in Ireland in 1856, where he joined his brother and designed a series of labourer's cottages and a modest church at St Johnston in County Donegal. Here he indulged his passion for critical writing, which had 1st blossomed in the local Bristol papers, contributing a myriad of articles on matters of art and architecture for the Derry Journal. But 1861 marked the year of his 1st competitive success, beating his fellow candidates for the chance to design and build Northampton Town Hall. A Ruskin inspired design featuring embellished Gothic forms, mural decorations, stain glass, and stonework. With an impressive commission under his belt and a growing architectural practice, Godwin's 1st wife Sarah Yonge, passed away. And so, in the mid 1860's Godwin turned a new page, upped sticks to London and began what was to be the most prolific, dynamic, and creatively charged period of his career. TURNING JAPANESE ! Godwin's love affair with Japanese decorative arts and oriental wood construction had developed long before his move to London and his discovery of Liberty's East Indian Art Warehouse. Bristol's eponymous port provided a melting pot of Japanese inspiration due to the massive influx of import trade from the Far East and it was probably there, where Godwin got his prized copy of Hokusai's Mangwa ( a volume of Japanese prints ), along with many artefacts with which he furnished his Bristol home: he was the 1st in England to decorate his home in the Japanese style. Godwin was not merely an occasional collector but a veritable devotee of the Japanese style, enamoured with the elegant simplicity of it's line and form, and more exuberant heraldic crests and floral motifs, among many other characteristics which he would subsequently adapt and incorporate into his furniture design, textiles, ceramic tiles, and wallpaper. Bristol also played host to the 1861 Industrial Exhibition, which featured a display of Japanese art, and it is likely that Godwin attended and fed his passion further. Godwin's appetite for the Japanese style seemed to be insatiable, and it is well documented that he scoured the national press for information on Japan, as avidly reading the travel journals of the 19th century Japanese tourists. 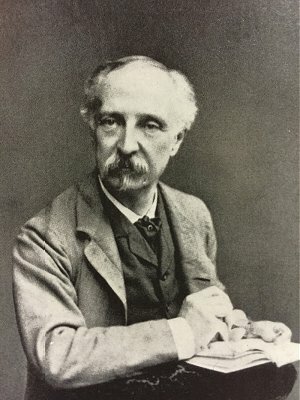 Although Godwin never set foot on Japanese soil, unlike Dr Christopher Dresser, his illustrious friendship with the Gothic Revival architect William Burgess, and the painter James McNeill Whistler bear testimony to his enduring infatuation with the style, their bond being cemented by a shared passion for Japanese arts and crafts, forming what we might loosely term as a mutual appreciation society. Indeed, Burgess is widely credited as being one of the earliest collectors of Japanese prints in the country. And so, we can easily imagine how these like minded heavyweights of the world of Art and Architecture must have nourished and sustained Godwin's vision. This vision based on a fusion of Oriental and Western elements in an innovative Aesthetic style known as 'Anglo-Japanese'.